The Days of Johann, an agility dog! : Gracie's favorite game! It's Gracie's favorite game evah!!! 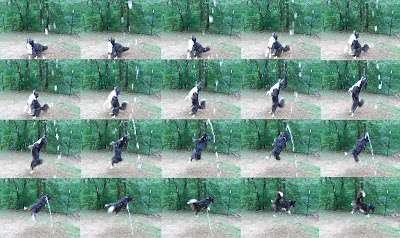 She finds jumping for a little container of water much more fun than a water hose. As a matter of fact, this ability got her a $100 gig entertaining little kids at a birthday party back when we lived in Indiana. When she's in her water zone nothing, and I mean nothing, will distract her from the next container of water. Oh yeah, she's ready! OK, here it comes! Mum had a little fun and used the 30 pic burst function on our camera. Fun huh? Be sure and click to bigify the pic, it's like a ballet! Here's Gracie getting her jump on! All we need is some dj bubbles and she'd be a big hit at any party!!! Music to our ears! 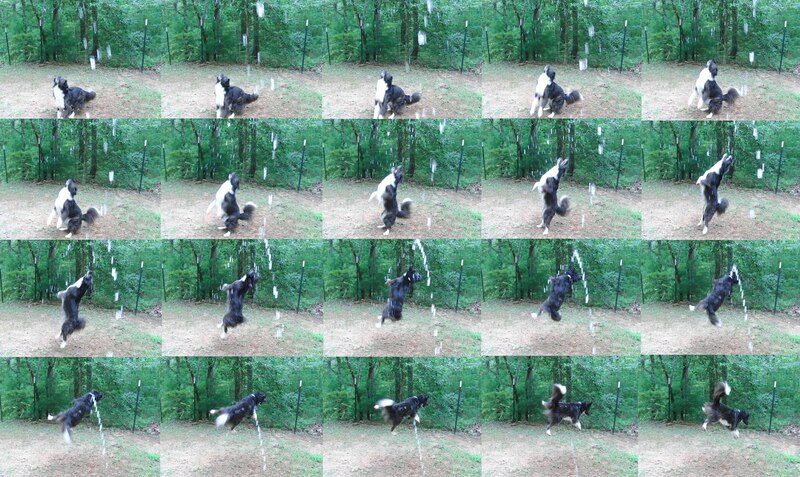 What a cool slow-mo video, Gracie and what a great way to stay cool in this hotter than hot summer! Omigoodness! Gracie is one beautiful, talented dog! I'm going to have to see if my Flash would like to catch water. He fetches rocks when we go to the river. Well, he tries to. There's a contest at my blog if you'd like to check it out. It's yesterday's post. Nummy treat!